With the cold weather starting to settle in, I am trying my best to keep my skin hydrated and nourished. Oils are a product that I am completely new too, when I think of body oils I think of being left feeling greasy but this is really not the case. 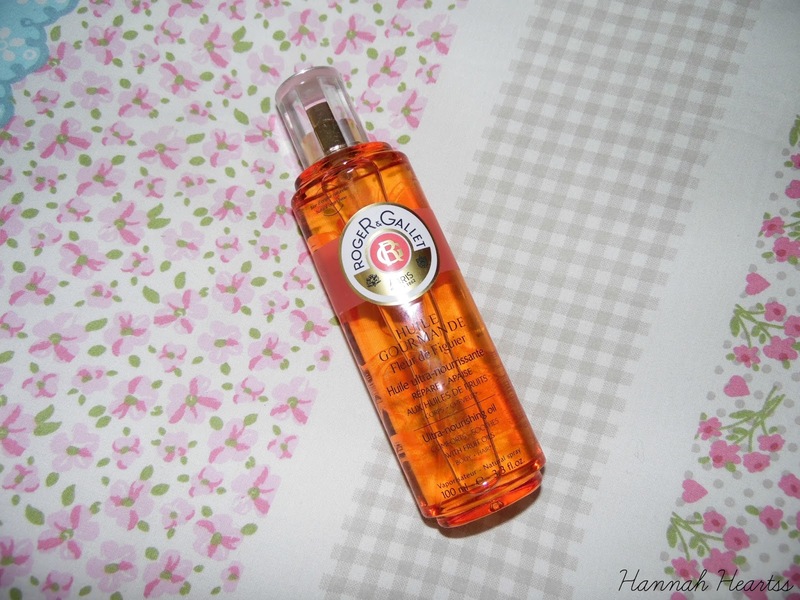 The Roger & Gallet Fleur de Figuier Ultra-Nourishing Oil* has started my obsession with body oils and I am so happy about it. My first impressions of this was good, the scent is incredible and really lingers on the skin which is one of my many loves about this oil. This oil is enriched with grape, pomegranate, blackcurrant, passion fruit, apricot and almond oil. From those alone you can imagine how they contribute to the scent, I must say this is one of the best smelling products I have ever used. Not only is it enriched with those wonderful things, this oil contains 95% of natural origin ingredients. This oil can be used on your body but also in the ends of your hair. The packaging is simple yet stunning. The bottle is made out of glass which isn't perfect for travelling however it does look stunning sitting on my shelf. The attention to detail on the packaging is lovely, on the back of the bottle is a lovely print which you can see through the bottle which is a nice touch. The cap of the bottle even has the logo on! The accents of the bottle are gold and makes the bottle look very luxurious. I didn't expect the product to have a spray cap, when I think of body oils I think generally think of poring them into the palm of my hand and normally ending up with too much. I love that you spray this onto the skin,it creates a lot less mess and you don't waste any product. I loved how this instantly left my skin feeling. My skin left silky and hydrated but not at all greasy. I applied this a couple of times before I headed straight out the door and wasn't left feeling greasy once I had got dressed. I have very dry skin and I can never find a product that hydrates my skin without layering on the products and being left feeling sticky and greasy until I started using this. I love to use this on my legs and arms. I have really noticed a difference in terms of hydration, specially in my legs. I have noticed that this gives a lovely sheen to the skin when it has first been applied and lasts for a couple hours. I really love this product, not only for how hydrated it leaves my skin but also for how good it smells. I will continue to use this throughout the autumn and winter to keep my skin feeling nourished. I recommend this if you have quite dry skin but can't find the perfect product to keep your skin nourished. This retails for £25 but is currently on sale on feelunique for £17. Have you tried this? What did you think of it?